Here are some common landscaping-related questions and answers. 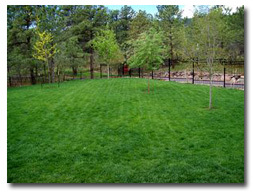 Please don’t hesitate to contact us with any of your Colorado Springs landscaping questions. What is the benefit of aerating the lawn in the spring and the fall? Aeration increased the ability of the turf to absorb water and increases air flow to the roots. Also decreases the amount of run off. Why does a sprinkler system need to be “blown out” or winterized? In this region, temperatures drop below freezing quite quickly. If a system has not been drained and there is water in the PVC and copper piping, the quick freezes can cause these pipes to freeze and burst. Also, the poly piping in the ground can eventually freeze and crack during the winter if left full of water. These cracks create “line leaks.” These leaks are often difficult to locate and cost much more to repair than simply getting the system winterized. Fertilizer is an application of the nutrients that plants need to fuel their natural processes of growth and reproduction. Fertilizer is applied to overcome deficiencies in specific nutrients (usually nitrogen, phosphorus, and potassium) and increases growth, flowering, and the vitality of the plants. Is a quick release formula that is very high in nitrogen to help the lawn “wake up” from the winter and green up and start growing quickly. Is high in phosphorous and potassium that strengthens the plants for winter survival. It is a slow release formula that keeps the lawn green longer, and should be applied in early October through mid-November. This is late enough in the season that it will not stimulate a growth flush. Lawns that have gotten winterizer fertilizer recover better in the spring, survive heat/drought better, and contain fewer weeds. Has similar chemical make up as the spring start up fertilizer, being higher in nitrogen to help stimulate growth and green up the grass. The only additional aspect is the weed control and ability to kill broadleaf species and crabgrass. In Colorado’s dry climate, Xeriscaping is a great way to save water, time, and money in your landscaping. The term comes from a combination of the Greek word “Xeros,” meaning dry, and “scape,” as in “landscape.” Xeriscaping is an attractive, sustainable landscape that conserves water and requires minimal maintenance. For more information see the Colorado Springs Utilites website. 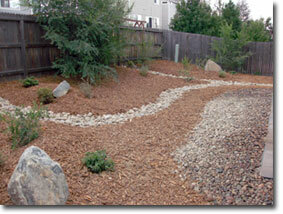 Check out our Porfolio to see some of our xeriscape work. One of our window wells isn’t draining properly, and after a heavy rain can even have a few inches of water. What can we do to fix this problem? There are a few different options to fix this problem. The general problem is that the grade is not properly sloped to push the water away from the foundation and the window well. The grade can be fixed by building up the soil around the foundation and creating a gradual slope away from the home. Two other options would be to install a drain in the window well itself that drains away from the home, or to install a sump pump that will pump out the water from the well and drain it away from the home as well. These are just some general explanations for how to fix the issue. Each home is unique and a specific plan would need to be made addressing the issues currently being experienced. Contact us today for a free estimate. Do you shovel driveways as needed? Or do i have to have a contract? And how about parking lots? We usually set up residential and commercial contracts slightly different, but the basic idea of both is that we agree upon a minimum depth of snow that is required for us to come and remove snow. Usually commercial contracts request a one inch minimum and residential contracts request a two inch minimum. Commercial contracts are generally completed by 7am and residential contracts by 10am (pending the amount of snow accumulated). Each contract can be adjusted to meet specific requests and needs of each customer. All estimates are free; please contact us with any additional questions. It’s a beautiful day today, and that makes me want to start “greening” things up around the yard. When can I safely turn my sprinklers back on without having to worry about them freezing up, or having to blow them out again before spring? We do not recommend turning on your sprinkler system until mid-April or early May because the risk of freeze is still really high until that point. Since we’ve had such a dry winter, your lawn can certainly use some water as the weather turns a little warmer. This year, we recommend simply using your hoses until about mid-May or so to water the lawn and that will help it green up quickly later in the spring. Also, aerating and applying a “spring start up” fertilizer once your sprinklers have been turned on will really help kick it into gear for the season. We have used Colorado Stoneworks for our landscaping needs in our business for many years. They are responsive, professional, affordable, and very good at what they do! I would recommend them to anyone looking for something as small as weekly mowing to as large as a landscaping remodel! This is a great company to do business with. It was a pleasure working with the crew that did our landscaping. They were courteous and very professional. They did great work were very respectful of our property. A special thanks to Al for making all the last minute changes go smoothly and working with us to get the results we wanted to see in our project!